The mystery surrounding this motor has led me to find out some points about this four-year production engine. It started in the fall of 1969 ending in 1974 model year. Some may remember the 1974 Cougar I once stored in order to safe guard its 351C 2V. Others will recall that I currently run a spare 1974 351C 2V in my '73 Pantera while its original 351C 4V awaits rebuild (a casualty of a POCA Las Vegas open track event). Let’s ignore the famous 351 Windsor engine to focus on Ford’s successor to the Cleveland --- the much heavier 400M whose 1972 introduction uses a taller deck, wider profile and big block (429/460) bell housing pattern. This block was de-stroked to yield the 351M in 1975, which barely overcomes its weight disadvantage. The Cleveland’s most noted feature is its heads. Early 351C 4V heads have wedge chambers, monster ports and valves measuring 2.19 intake and 1.71 exhaust designed for big blocks. The design stems from SCCA Trans Am winner of 1969 as they rested atop the very high-revving BOSS 302s with oversized 2.23 intakes. BOSS 302s for 1970 were reduced to our 2.19”. The closed quench style chambers were opened in 1972. This massive flow characteristic gives us poor street performance but an outstanding one on race courses demanding high revs in the 7,000+ range. To take advantage of this, a stroker of 377 to 408 is needed to provide enough volume and revs. 351 2V heads have smaller ports, open chambers, 2.04 intakes and 1.67 exhaust valves found in the long gone Cougar and my current Pantera. High performance SB Chevys would love to have our 4V size valves compared to their 2.02/1.60's. And, I found one drag race 350 Chevy modified to mount the Ford Cleveland head in San Mateo in an effort beat Jack Roush’s lowly 351C Tijuana Taxi Maverick. 2Vs offer great gobs of low end torque but limits the high end. The Aussie 351 heads uses the 4V wedge chambers with the smaller 2V ports to give us both excellent flow and burn characteristics more in keeping with the 351 cubic inches and bottom end construction so limited in most Fords with their oiling, rods and crank shortcomings. So what’s this all mean? For the 2V heads engine seeking more, consider the Aussie heads. These 302 and 352 Aussie have the smaller wedge chambers with the 2V 2.02/1.65 valves. Our 2V heads tend to cause detonation problems. The 4V heads need more displacement and higher spin capability (7,500-8,000) than stock so check out a stroker with a forged crank, longer rod length, and stronger connecting rods. But be sure to have your block sonic tested to insure proper wall thickness. Use push rod guide plates and screw-in adjustable studs to steady your valve train regardless of heads. Eye the single plane intake manifolds for track and dual plane for street. Edelbrock Performer for 2V and 4V yield good low end torque and work well on the high end making them a fit for street use. If you modify the dual plane, make sure that you cut no deeper than an inch. Their Torker is a single plane designed for drag and road racing. Older designs are from Offenhauser, Weiand, Holman/Moody and Ford. The following information is largely from Muscle: Mini or Maxi by Fred Freel in Petersen’s Complete Ford Book printed in 1973. Those of you who have found the Boss 302 (Part #D1ZV-6010-B), Boss 351 (D1ZZ-D), 351 Cobra-Jet and some 400C blocks with 4 bolt mains, have a strong foundation for mods. But two bolt mains can accommodate considerable abuse with mods of their own. There are four Boss type heads from which to select. Two are from the Boss 302 and two for 351C. The best heads to use are the 1970 Boss 302s. We need only drill a 11/16” hole in the deck for the Cleveland water passage using its gasket as a guide. These have small 57cc chambers and mate to either the original Windsor block or the 351C to raise their compression. Ratios are expected to be 9.44:1 for 289, 8.97 for 302 and 11.62 for 351C/W. For lower Cleveland compression figures, select the Boss 351 for 9.5:1. 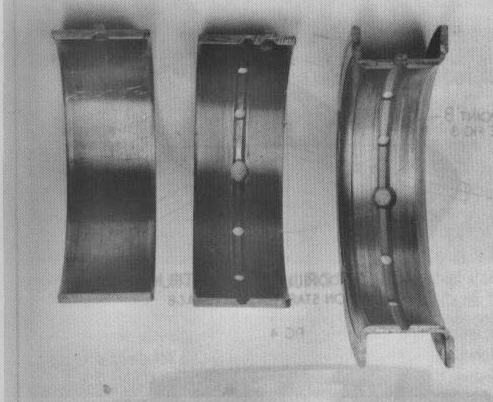 Cranks come in three main bearing diameters; 289-302, 351C and 351W-400C. Only stock forged crank is the Boss 302 with 3” stroke. All stock 351Cs are cast. Remember, though, that the Boss 351 crank is a specially selected one at the Ford plant and is a bit stronger stock. Rods come in six stock sizes so the opportunity to tune your engine to your tastes is there---3 for 302 and 3 for 351. How about rod/stroke ratios of 1.90:1 like the old Chevy 283? This rod length divided by stroke is thought by some to be ideal. It allows very good high rpm without too much loss of low-end torque. High ratio yields top-end performance while low ratio give us better low and mid-range power. Boss 302 has a ratio of 1.72:1 and its brethren Boss 351 is in Steve Webster’s recommended range of 1.6-1.7 at 1.65:1. The stock 351C is about 1.65. Big cube strokers often have ratios near 1.5; meaning they’ll pull hard but not necessarily rev quickly. So, if you are going for a stroker engine, take the time to calculate the rod ratio. This will tell you how the engine is expected to respond to the right pedal. Chevy comparisons for us 57 Bel Air types have a rod ratio of 1.9 for both our 265 and 283 engines. They sing the very high notes with the right cam, valve train and light assembly. That’s one of the reasons they faired well in early hot rodding days. Meanwhile my favorite 327 spins its crank using a 1.754 ratio. The hot revving Z28 TransAm 302 copies the Bel Airs at 1.9. SBC 350 move a reasonable 1.635 but the stock 400 pokes a leisurely 1.52 with tons of torque. I ran across two attractive ideas and I hope to use one or both of them as I rebuild my warmed track motor. The first is to insert a screw-in restrictor (from Ford SVO) between the main and cam bearing to cut excessive oil flow to the cam bearing leaving more for the mains. But if I use fast bleed lifters to reduce my hot cam lope, I’ll have to pass on this fix. The second, is a Chevy racing trick used on their oil starved V6s. Here, the main bearing bores of the block section only are grooved .125” by .125” deep are made circumferentially across the oil feed hole for 180 degrees on the front set. The Chevy rear main groove of 135 degrees stops short of the main oil feed but intersect the oil feed hole from the cam bearing. 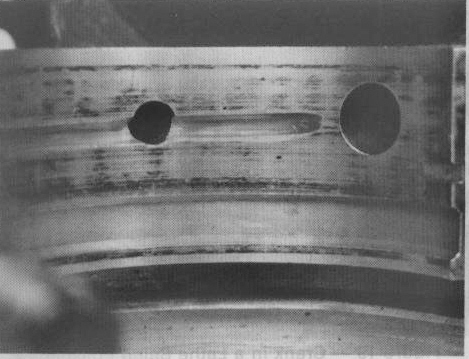 The main upper bearing shells are drilled with four .125” holes to flow the extra oil. This places more oil at the ready for the main bearings. Keep in mind that the big boom stress is largely taken by the bearing cap not the block side. I think grooving all five 351 mains should leave more oil film on each pass. I’ll check the crank for cross drilling to further insure oil coverage while is block is being prepped. The same publication speaks to the need to replace Shelby’s own FIA 289 Cobra’s tired engine with a new one. Mike McClusky, who maintained Shelby’s fleet, chose a 1972 Boss 351 to do the job. It was balanced, cc’d, valves lightened and triple-angle cut. The foot wells were notched because the big engine was set lower and 10% back to improve handling. Custom headers were fashioned while the dual point distributor added the needed spark. Beefed up C4 made effective launches. Remember too that the much maligned C4 uses the same design as the C6, FMX and Turbos but do require a simple mod. Removing a spring makes Falcon units shift as crisply into the Galaxies beyond. Also featured was the Wayne Gapp and Jack Roush Pro Stock Pinto. It turned e.t.s in the low 9s with a 73 Cleveland as motive power through Lenco to the 5.57 cogs. It reminded me of Phyllis’ 73 Pinto wagon but she had a single lever 4 speed and taller gears. As I learn more about this engine, I am more disappointment at Ford’s lack of foresight. It truly should have continued to develop it. Little things like strengthening the bottom end, addressing the oiling problem, making lighter rotating assemblies, higher reving valve action and improving the port routing for tighter flows would have taken away the opportunities from aftermarket suppliers. The engine has plenty of torque and just needs to rev dependably to a much higher redline. Or, maybe they did. Meanwhile, does anyone have porting drawings for the 4V and 2V heads? Send it to me.